​Hongmen Crowd Control barriers are customizable, lightweight, portable barriers and retractable gates for crowd control requirements in all types of location. They are a very unique and attractive yet affordable solution to security control issues for both foot and street traffic. Main material uses industrial grade version 6063-T5 aluminum alloy, the gates are fully retractable, diverse design aims at many varied occasions. Come with custom lettering and choice of reflective tape colors. 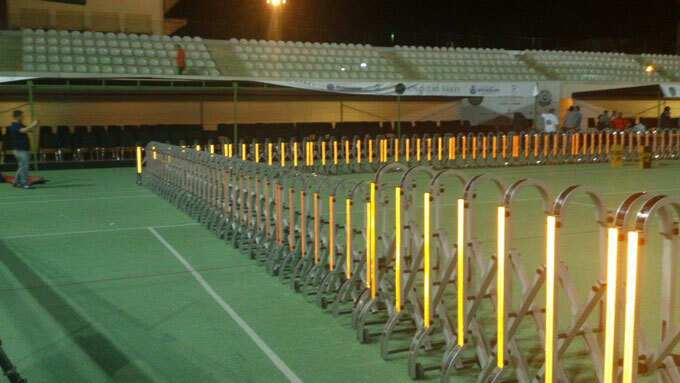 Panels with lithium cells power LED lights for additional security and visibility.